Nokia has announced the Lumia 510 in a press release, distributed this morning. The device sports Windows Phone 7.5, and will be marketed on the success of the Lumia 610. Carrying on Nokia's commitment to low-level and 'dumb phone' markets, the company expects to increase its revenue from said sources. 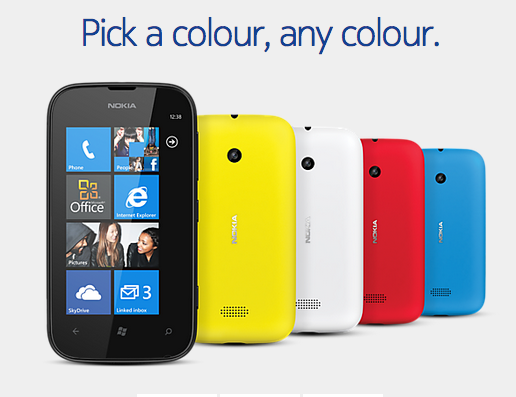 It's clear from the product page the Lumia 510 will be available in five colours that are also used in Nokia's high-end Lumia Windows Phone 8 devices - black, cyan, red, white and yellow. We previously touched on the new device earlier this month when it was spotted in the wild with pricing and accurate specifications leaked. "With the Nokia Lumia 510 we continue to meet our commitment to bring Windows Phone to new, lower price points. People who use Windows Phone quickly realize how much more intuitive it is than other smartphone platforms, and Nokia Lumia is the best embodiment of the Windows Phone experience. With the Nokia Lumia 510 we're looking forward to welcoming more people into the Windows Phone experience." The full specification readout from Nokia includes a 4-inch WVGA 800x480 screen, 1300 mAh battery, 5MP camera, 256MB RAM, and 4GB storage. Not bad for a low-level Windows Phone. Retail price is expected to be around $199. As well as the less advanced specifications and attractive price, the Lumia 510 provides consumers free access to the array of Nokia apps and services. We're awaiting information on availability, but we originally covered news of the Lumia 510 heading to China.